Our mothers, grandmothers, great aunts have come a long way in the number and types of occupations available to women over the decades. However, even in 2013 there are still some positions very limited in numbers due to them still being male dominated – example being professional horse racing jockeys. To better know some of the types of occupations our female ancestors would have done, you do have to know some of the common terms used years ago, so when you see that name listed you can better figure out what your ancestor did as a job. Starting with accoucheuse’ (also spelled accoucheur) and the term ‘grace wife’ or ‘howdy wife’, this is a mid-wife or one who assists during childbirth. Many women have held this position over the centuries, perhaps one of your ancestors. 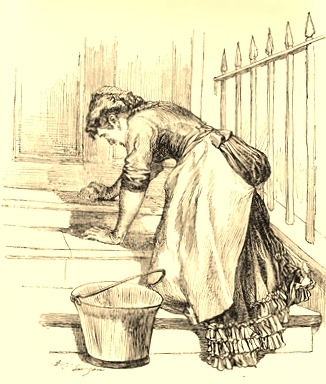 Then another common job was that of ‘charwoman’ which is a woman who cleans churches, buildings or homes for payment. Here is one you may be less familiar with, that of ‘chautauquan’. It refers to a woman or man presenting a lecture, educational entertainment or concert to the general public. This was a very popular activity in the United States in the late 1900s and continuing into the 20th century. A long standing female occupation has been ‘midinettes’ and ‘milliners’. Dressmakers and seamstresses would be midinettes. Ladies who made and sold hats would be milliners. A similar occupation was that of ‘tire woman’, who made costumes for theater actors and those who made the latest fashion clothes that were displayed on dolls for shops. Women were not accepted too often as writers of stories or literature. The term that applied to those ladies who wrote was ‘bluestocking’. With the coming of the Industrial Revolution in the 1830s and 1840s and the use now of sewing machines, women became factory workers. Women also had the job of a ‘necessary woman’, the person responsible for cleaning out daily the chamber pots (portable indoor toilets) in a household or hotel. Taverns have been popular for centuries in all lands. Many operated by men, but if operated or worked by a female, the term was ‘alewife’. Hard work would be part of the description for a ‘maid’. They generally did the laundry, washed dishes, cleaned the windows and floors, mostly the more difficult work in a house or hotel. Illustration: Image of a scullery maid.